Oh Captain, My Captain! After the outdoor ceremony in Fish Creek, this couple boarded the tour boat Quo Vadis for a slow, romantic tour with their friends and family. Included were refreshments, appetizers and sightseeing along the picturesque Door County coast, Green Bay side of the peninsula. It included Eagle Lighthouse, some spectacular homes and scenic bluffs and beaches. The boat's captain gave passengers an opportunity to "play captain" for a spell, complete with a captain's cap and the chance to steer the boat. when it was the bride and groom's turn, they engaged in a cute photo moment. The day was warm and the surroundings breathtaking. The evening went on with an outdoor reception at the couple's Sister Bay home (available for rentals!) --organized and decorated by the couple. A gourmet buffet dinner greeted guests, an outdoor dance floor was set up and strings of party lights glowed. Gorgeous down to the last detail. And the couple was sweet and fun. Thinking back on the boat tour--I've photographed weddings on boats a handful of times. 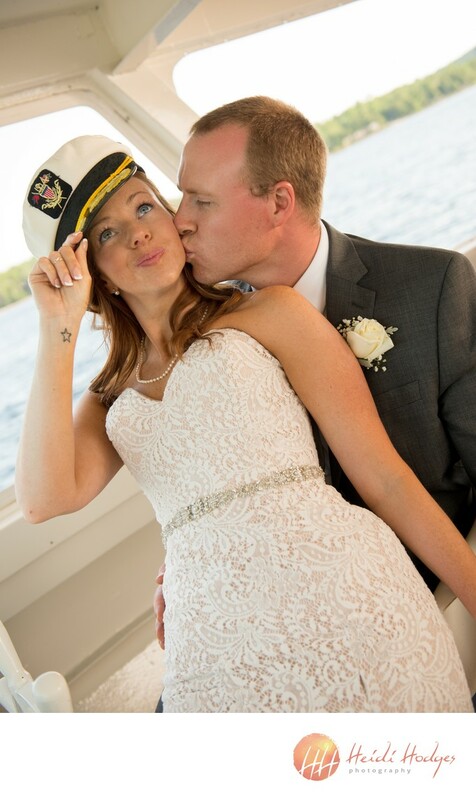 If there is time, it's truly a great addition to a wedding day, especially in Door County with such outstanding scenery, and great tour operations, like the Quo Vadis boat. Couples get a chance to quietly unwind with their closest people, without pressure. 1/400; f/4.0; ISO 400; 44.0 mm.